2/14 is all about love in all it's subtle shades and splendor. 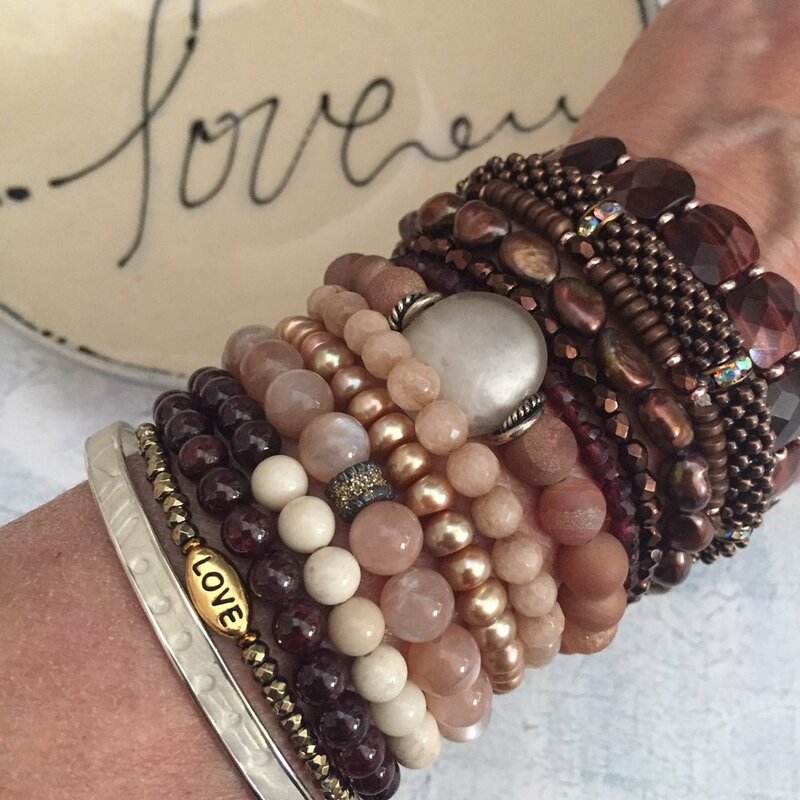 Dusty rose, blush and beige, russet and rouge, garnet, copper, moonstone, drouzy, polished fossil, dyed pearls, red tiger's eye, pink gold, and agate are stacked to express. Sharing the love! Clay on silver bangles are paired with mine-rough gemstones for their healing qualities. LOVE... for the deep affection I have for this planet; its life giving properties and its unparalleled natural beauty. LIGHT... to make visible the error of our ways FAITH... to trust that we can make a change for the better. there are no words and no way to reconcile such meditated evil. Sending thoughts, prayers, love, light, and a faith beyond reason to the victims, their loved ones and to this country plagued by senseless violence at every turn. If only tears could wash away the evil and the pain. SOMETHING HAS TO CHANGE! This is not the world I grew up in or the world I want my children to raise their children in. A box of old crayons found new purpose in this color filled collection of bracelets. A mix of semi-precious gemstones are flanked by sterling silver, fossil and agate with a hand crafted drop charm of crayon chards under resin in a silver plated bezel frame. I can't seem to get enough pyrite these days. Loving its metallic luster, aged brassy patina and ancestral vibe. Thinking moonlight on the water; a shimmering darkness. Tourmaline, abalone & silver. Nothing says New York summer better than the Hamptons and nothing says Hamptons to me like an abundance of Hydrangea hedges. Those deep purples and vibrant blues speak to me and the green... well it just says forever. This week, a friend shared with me that the new ring I made her was dubbed her compassion ring; a constant reminder to treat herself with the same care , kindness and compassion that she shows to others. It truly warmed my heart and got me thinking about my own self care as we enter a new year and a fresh start. What works, what doesn't; what I should relinquish and what needs more attention. Thank you my friend, your kind words and willingness to share were nourishing food for thought to reflect on this past year and welcome the next. Lessons from the process. I have always emphasized the importance of the creative process. It is the space where new ideas are formed, lessons are learned, mistakes are made. This large platter; hand formed in red earthenware, painted with slips, underglazes and wax resist and fired twice is a great reminder of that. It was a challenge to work on a platter of this size. I can only push and pull the clay so far before it begins to make decisions of its own. Admittedly, the cracks around the perimeter were unplanned but not unexpected. They are the clay's memory of the stress it underwent in the forming process when I had to piece together multiple slabs to achieve the size. I can't deny my initial disappointment when I opened the kiln but it faded quickly as I studied the imperfections, recalled the sense of experimentation I felt through the process of creating and internalized it to recognize the many shifts in my own physicality as life pushes and pulls me to fit a preconceived form that I may not always feel comfortable fitting. Its the cracks in the facade that provide a freeing sense of breaking away from a predetermined path, open the door to new direction and remind me to remain ripe for change. There’s something special happening in my sewing room and I’m not making reference to the commissioned scrapbook quilts I’ve been doing a lot of lately; although they are pretty special. It’s a feeling that’s been flooding my senses as I sit at the machine and sew. An acute awareness of my mother’s presence. Perhaps it’s the angle at which I’m seeing my hands resting on either side of the fabric as I guide it through the machine and the strong resemblance my hands have to hers. Or maybe it’s the strange déjà vu-like sensation I get as I roll two adjoining seams together coaxing them to fit just right, as I watched her do so often. It could be the sewing table that sits adjacent to where I work always visible in the corner of my eye. It houses the old Singer she taught me to sew on, no longer in use but serving as a great surface for my overflowing bins of fabric. Or, it could be the stack of now vintage Butterick and McCalls patterns stored in the cabinet under the machine of the many projects she tackled. A Raggedy Andy and Care Bear with his googly eyes and heart shaped felt nose rest on a chair in the corner of the room, both too precious to ever be used when my kids were young. Maybe it’s the sewing table chair with the little hidden drawer under the seat that I always loved as a child. Or perhaps the photo that’s tacked to the bulletin board that faces me as I sew. It’s a picture of my parents with my older daughter at an early dance recital. It’s sandwiched between two images. On the left is a journal quilt I did for Odyssey Art while on board the Crystal Symphony for a month in April 2000. My husband took care of the girls while my son and I cruised up the west coast of Africa from Cape Town to Southhampton with my Bernina sewing machine. That was 9 months after she passed away. On the right is an image of the Flag of Remembrance a 20 x 27 foot stitched memorial to the victims of 9/11, a massive undertaking that took me three years to complete. There’s a chronic sense of longing to share all that has happened in the 15 years since she has been gone. The accomplishments and failures, the joys and disappointments; but at the same time there’s a sense of comfort that permeates the room and wraps me in a virtual blanket of heartwarming nostalgia, deep gratitude, love and a sense that in some other worldly way my mother is somehow enjoying the process right along with me and basking in the knowledge that she taught me how to sew. Some serious hair pulling going on! So, after yet another website issue; this one proved to be fatal. I have thrown in the towel on my (archaic, those are my 20 something year old son's words) website and have started rebuilding it from scratch. It pains me to say that as I mourn the thousands of dollars spent when I hired a pro to build the first one. I never imagined that less than 5 years later it would be considered a dinosaur. So, here I am, attempting to do it myself this round with the help of a web program called Squarespace.. Please excuse all the bugs and glitches as I wade through the process for the first time.